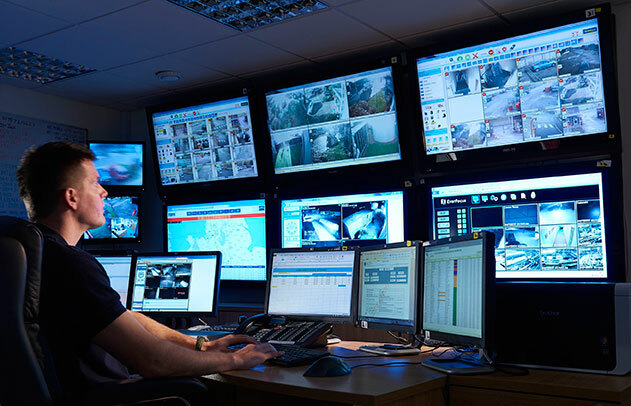 Central Monitoring Station (CMS) services are used by many security system owners who require high security monitoring. It is suitable for both residential and industrial sites. The CMS System consists of two main components: Signal Receivers to convert all alarm signals into raw protocol codes and Central Station Software that allow operators to view, manage and catalog incoming alarm signals from a massive number of alarm panels. The Central Monitoring Station is equipped with both hardware receivers and Central Monitoring System Software. 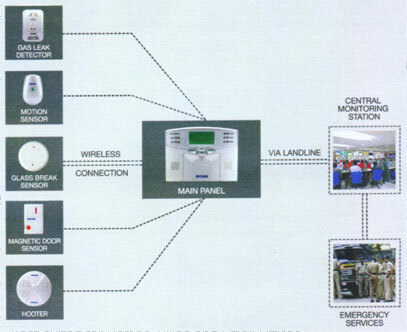 Central Station receivers differ based on the type of communication channels they monitor. Telephone Communication requires telephone line receivers while Internet Communication requires Internet Protocol (IP) receivers. These receivers listen to the communication channels, and then convert the transmission signals into alarm signal codes, which are sent to the central station software. These alarm signal codes are displayed for CMS operators to view, manage and report according to specific procedures developed by CMS services. Main Panel – A variety of sensors wirelessly connect to main panel which in turn connects to Central Monitoring Station (CMS) and Hooter. When an incident occurs, in addition to loud alarm from Hooter, CMS gets alerted and trained staffs take necessary action such as calling pre-designated numbers, calling state owned emergency services etc. Hooter – This is the alarm sounding device. It acts as a deterrent to whoever attempts to break-in. It is loud enough to be heard from the 7th floor of a building. Magnetic Sensor – Senses any break-in from doors and windows. A network you understand. A Central Monitoring System that works for everyone every day. Contact us today and join the many pharmaceutical and biopharma research labs, the food industry, hospitals and medical institutes and warehouses relying on ELPRO’s advanced datalogging solutions (references available upon request). You’ll add a new dimension to your work life – a secure Central Monitoring System that ensures quick and easy access to data from any PC in your company.